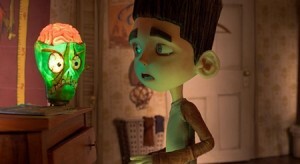 Childhood is a trying time, and the endearing hero of “ParaNorman” has more trials than most. A father who doesn’t understand him, a sister who finds him annoying, a bully who loves to pick on him, and a town full of ghosts that only he can see, Norman has quite a few troubles on his slight shoulders. But as others begin to open their eyes to his abilities and Norman learns the value of trusting those around him, ParaNorman delivers some great lessons while treating its audience to laughter and suspense. The small New England town of Blithe Hollow is preparing for an annual celebration commemorating the historic execution of a witch by an old town council, but Norman Babcock is more interested in talking to his ghost grandmother and watching horror flicks. He has few friends, but begins to gain attention as fellow school outcast Neil reaches out Norman. Though reluctant at first, he and Neil quickly become friends. Mr. Prenderghast, Norman’s uncle and the local crazy recluse, also makes contact, trying to pass on a family responsibility that only Norman can accomplish. Each year on the anniversary of the witch’s death, a story must be read to the witch’s grave to keep her from returning. Norman does not want the responsibility initially, but after his uncle’s death and increasing visions about why exactly the witch was executed, he resolves to head to the cemetery and read the story. When this tactic does not work and “zombies” instead rise from the grave and descend upon the town, Norman and his sister, Neil and his brother, and the town bully Alvin are thrown together to save everyone from the witch, the zombies and even themselves. At the end, Norman has found the acceptance he always needed and comfort in his strange ability. Adults may find the overarching message of ParaNorman to be heavy-handed, but it is still an important message for children to learn. This is a story about how the unknown or misunderstood lead to fear and how that fear can change even the nicest people. It is his openness to learning about things that are normally feared that gives Norman the keys to solving the mystery of the witch’s hatred, and Norman’s own experience as an outcast that gives him the empathy and strength to win the day. Children will appreciate the message and it is delivered amidst some genuinely funny, icky and suspenseful moments that are entertaining. Adults too can learn from the film as the children at times have to tell the grown townspeople to act like adults. Aside from the story, the stop motion animation is seamless and one of the best executions I’ve seen of this medium. Mixed with the CGI graphics, it is easy to be sucked into Blithe Hollow. The overall look of the movie goes from a soft mellow feel that reminds us of old photos to darker, more haunting tones. One thing to watch for if you are a Claymation enthusiast is the small clip after the final credits – it does not involve any additional story or jokes, but is just a fun 30 seconds that brings Norman to life in front of your eyes. Other treats throughout the film include writer/director Chris Butler’s nods to the old horror films that he loves. Some of the best jokes are references these slasher flicks that many of us grew up on. Other jokes in the film fall flat or frankly cater very much to a younger audience, but the overall pace keeps those from tripping up the story too much. The horror of the film is based on suspense and real emotions rather than blood and guts. Children will definitely feel apprehensive, but overall the mix of story, suspense and comedy will entertain them and open their minds to the lessons of the film. 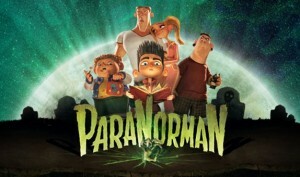 If you’re a parent, ParaNorman is a great movie to take the kids to. You can probably skip the extra expense of watching the movie in 3D. If you don’t have children but are a fan of Neil Gaiman or Tim Burton, you’ll definitely enjoy this film. Otherwise, it is best to wait until for the DVD. This entry was posted on Wednesday, August 15th, 2012 at 11:46 pm	and is filed under Film, News. You can follow any responses to this entry through the RSS 2.0 feed. You can skip to the end and leave a response. Pinging is currently not allowed. « Ron Howard is Making A Jay-Z Movie!! !